I’m surprised to see that I still frequently use pretty much every on the original list for this topic–15 tools (mostly apps and websites)–even though I wrote that post in 2014. In fact, many of those tools keep getting better. The tools from that list I still use are: Mozy, Box, Basecamp, Trello, Google Docs/Forms, Mailchimp, Jing, Feedly, CapitalOne 360 Online, Mention, Hootsuite, WordPress, Evernote, and a Blue microphone. Shopify: I now use Shopify for all of our e-commerce needs. In 2014 I was using something called ShopLocket, which no longer exists, and then I used both Celery and Shopify for a while. But I found that it’s just easier to use one e-commerce platform, and Shopify is great, especially with the sheer number of third-party apps you can purchase for it to customize it to your needs. For example, we sync Shopify with Shipstation to communicate orders to our website, and we use the Bold Recurring Memberships app for Stonemaier Champion. Dropbox: I use Dropbox to store and share large files with manufacturers, localization partners, graphic designers, and artists. For me, it works really well for long-term storage. Oddly enough, I also still use Box, as it’s easier to navigate than Dropbox. WeTransfer: I use WeTransfer for one-time large file transfers. Sometimes an artist needs to send me a ton of PSD files, and while I don’t mind having them on Dropbox for the long run, sometimes a one-time transfer is just cleaner. Setmore: I use Setmore for scheduling meetings at Gen Con. Setmore is actually designed to help businesses accept appointments, but I simply indicate on the app that the “office” is closed 361 days of the year (every day except for the 4 days of Gen Con). I have a booking link from Setmore that I share with international partners, designers, and the media, and they can pick a day and time that works for them. The one catch is that for some reason that is beyond me, Setmore’s default time is the current time zone for each user, not the time zone of the location. So you’ll need to remind people to manually change the time zone when they make an appointment. Discord: I recently started using Discord to coordinate with artists on a specific project. It lets you create a private, invite-only chat room (a “channel”). I wouldn’t use it for every project, given that I have different artists working on art in the same world, it’s really helpful for them to see and talk about what they’re working on. JotNot: I use JotNot to scan documents. It’s an app on my phone that takes a picture of a document, instantly cleans the document, and coverts it to a PDF. This is super helpful for sending documents to my accountant. If I had to scan dozens of documents at a time, a printer/scanner solution would be better, but JotNot works great for the occasional scan. PremiumBeat: I use PremiumBeat to buy quality, royalty-free music for our teaser trailers. I particularly like the Production/Film Score section. Most songs cost $49. I like that you can choose different lengths and number of loops for the same song, depending on the length of your video. Transferwise: I use Transferwise to wire transfer funds to international independent contractors. I’ve been using PayPal for this purpose, which is fine for small transactions, but Transferwise seems much better for both parties in terms of fees and currency conversion rates. However, I’ve found that a normal wire transfer is better for most of my international partners to send money to me (I’m not sure why). Slack: I use Slack to facilitate communication between volunteers at conventions. I must admit that I don’t use Slack much myself–it seems like a great way to have private group conversations on your phone, but I don’t like to have private group conversations on my phone–but it was helpful for volunteers to use it at Gen Con last year. 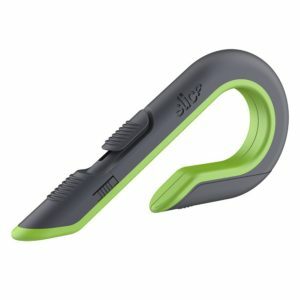 Slice: I use Slice to open packages. Unlike everything else on this list, it’s not an app–it’s an actual, physical tool. Before I got my Slice opener, I’d use scissors to cut open packages, and they were more effective at cutting me than the package. Slice is built perfectly for this purpose. What are some tools you consider indispensable? Any recommendations? Thanks for the helpful list! I’m going to check out JotNot now. You mention still using Jing, which appears to now be SnagIt? Personally I just use the Windows Snip-It tool. It doesn’t have a lot of bells and whistles, but it’s free and already included in Windows. For a quick basic screengrab that you can use on a timer and add highlights to, it’s very handy. And if I need to do anything more complicated, I’d be using Photoshop anyway. Thanks Dan! Mine is still called Jing, though perhaps a newly downloaded version of it would have a different name. Thanks for your Snip-It recommendation! A great suggestion for Transferwise at an excellent time for me. I’ll soon need to pay for manufacturing in a foreign currency and this will save some serious cash. Thank you, Jamey! I see you use JotNot for scanning documents. Did you know that Dropbox’s newest mobile app supports that as well? It’s really easy to use and uploads the scanned document as a PDF or an image file straight into your specified Dropbox folder. I like to use fewer apps whenever possible. Thanks for the heads up about the Dropbox mobile app! I didn’t know about that, but it sounds quite handy. Try OFX for international wires! Only 15 Usd and great exchange rates. – Google Docs: To quickly create mobile-accessible spreadsheets and docs that can be easily shared. – G Suite: To use the gmail interface for our overworldgames.com email accounts. – Docusign: To digitally create and sign contracts. – Mailerlite: To create and send newsletters at a lower price than mailchimp and to integrate mailing list sign-ups within our website. – Square: To take credit card payments at conventions, create promo codes, and use as a web store with no monthly fee. – Asana: Task tracking software with lots of features in the free version and more project management features in the paid version. – Meetup.com: To organize playtesting and gaming events in the community. Thanks for sharing! Google Docs is on the original list, but I really like the addition of Docusign and the others. For me, I’m getting great use out of Component Studio for my prototyping. I can work on my prototype at home or at work (cough). Before that, I was using Photoshop, and while I love PS, it’s an unnecessary pain to try making and changing one hundred or so cards every time I decide to make a small tweak. Hi Jamey, Some of the tools a publisher needs are marketing tools. You seem to have done well using social media channels. I admit I haven’t gone through all of your articles and I have a feeling there is one about marketing there somewhere. My question is, if you could only focus on two social media outlets, what would they be? That’s an interesting question. I’ll include some links below about social media. If I could only focus on two, in the board game world, they would be Facebook and BoardGameGeek.